The sport of jousting has deep roots in Europe, so it is no surprise that the sport came to the U.S. during colonial times, although it did not gain popularity until after the Civil War. In 1962, the Honorable Henry J. Fowler, Sr., a Delegate from St. Mary’s County (home of Maryland’s first colony), introduced a bill into the Maryland House of Delegates proposing jousting as the official state sport. The bill passed both chambers by an overwhelming vote and was signed into law by Governor J. Millard Tawes on June 1, 1962. Maryland became the first state to adopt an official state sport. Now 50 years later, the sport here in Maryland continues to be popular with local jousters competing within the Free State and nationally. When most people hear the word “joust,” they think of knights in heavy armor charging at each other with huge lances trying to knock another knight to the ground. That form of jousting began during the Middle Ages. It got its start as a battle strategy during wartime—a man knocked from his horse is less likely to kill you. From the battlefields to the tournament fields, jousting turned into a way for kings and queens to showcase their most skilled knights. Today, this form of jousting can still been seen at such events as the Maryland Renaissance Festival or Medieval Times. However, the competitive nature is now more for show. Interestingly enough, the first form of jousting made a reappearance in a competitive way with the show “Full Metal Jousting” that debuted on the History Channel last year. In the show, the object was to earn enough points (from hits on various parts of your opponent’s armor or knocking the opponent off his horse) to advance to the next round. In the end, one “knight” remained. So what is it like to get a chance to joust as they did in Middle Ages? Challenging for sure. “And yes, being ‘unhorsed’ in armor does hurt, it hurts really bad,” Jake said. With the invention of gunpowder, lances were no longer needed on the battlefield. Although they were still used at tournaments, knights began to hone their skills by aiming their lances at small metal rings instead of at each other. When Cecil Calvert, the second Lord Baltimore, founded the first colony in Maryland in 1634, he brought the sport, typically called The Ring Tournaments, with him. Through the years, the sport transformed from one restricted to the wealthy or members of high society to an open form of competition. Today, the traditions and pageantry of the Middle Ages still prevail but with a more modern twist. Jousting has become a family sport, open to both sexes and any age level. The object of modern day jousting is to spear up to three rings while riding your horse through three arches from which hang the rings. Beginners can participate in leadline or walk classes where rings are almost two inches in diameter. More advanced jousters gallop at top speeds spearing rings only a quarter inch in diameter. The track is 80 yards long and the first arch is 20 yards from the starting point. The other arches are placed 30 yards apart. At current tournaments, jousters may participate in costume, or wear conventional English riding attire. In keeping with tradition, riders register under made-up knight or maid names such as Sir Knight of Cooksville or Maid of Woodbine. The Maryland Jousting Tournament Association was founded in 1950, 12 years before jousting was officially named the state sport. The organization was instrumental in establishing a set of rules and a series of tournaments for the state. Now, the association attracts members from all sections of the state, as well as Washington, DC and neighboring states. Their first meeting was held on March 5, 1950 in Overlea. Unfortunately, only four people attended. Mary Lou Bartram, George Bartram, Henry Fowler and Raymond Owen did not give up hope of forming an association and held a second meeting on March 26 of the same year. This time, 22 people were present and the association was officially organized with officers being elected. George Bartram became the first president with Charles Brady acting as vice president. The combined secretary/treasurer job was filled by Mary Lou Bartram and membership dues were only $1. The official name of the organization at the time was the Maryland Tournament Association and was later named the Maryland Jousting Association. In 1951, it became officially known as the Maryland Jousting Tournament Association, Inc., which is what it is called today. The first annual State Championship Jousting Tournament was held in October 1950 at the Ritchie Raceway Trotting Association in Glen Burnie. The first State Champion was George D. Bartram riding under the title of Knight of Cedar Lane. He also won again in 1951, 1952 and 1955. Each year, the state championships are held on the first Saturday in October at a different location in Maryland. Mike Virts (Knight of St. Marks) holds the record with the most State Championship titles. He won 19 times stretching from 1972 to 2003. Virts is also a 10-time National Championship winner. 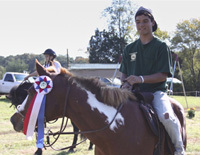 The 2012 championships were held on October 6 at the Anne Arundel Fairgrounds in Crownsville. Nearly 60 riders competed in classes from Novice to Professional. At the end of the day, the State Championship class was held featuring qualified professional class riders. Corey Minnick, who rides under the name Knight of Bennies Hill, won for the second time in a row, making this his fifth State Championship title. The Novice Class winner was won by Ian Flaherty (Knight of Tynwydd). 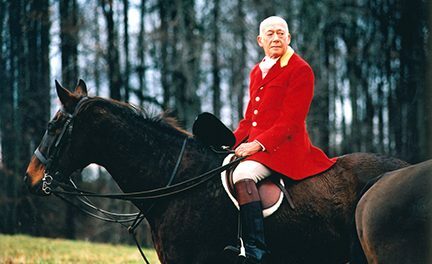 Malcolm Macy (Knight of Macy Meadows) won the Amateur Class. Lily Fisher Flaherty (Maid of Tynwydd) was the Semiprofessional Class winner. The Professional Class was won by Bob Enfield (Knight of Sir Lancelot). On July 14, 2012, three nationally ranked Maryland jousters were honored with the Maryland Horse Industry Board’s Touch of Class Award. 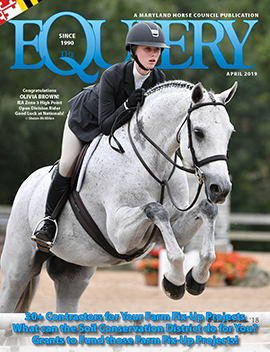 The award is given out monthly to Maryland equestrian natives who have excelled locally, nationally and internationally. Corey Minnick, Mikayla Miller and Anthony Reinhold received the July 2012 Touch of Class Award for their achievements on the national level. Minnick, from Hagerstown, recently won his third national title at the professional level. As stated earlier, he wrapped up his successful 2012 season as the Maryland State Champion. Reinhold won his national title at the Novice level in only his second year of jousting. Reinhold, who attends Chesapeake College as a freshman, has jousting titles in his blood, as his grandfather Buddy Wooters was a five-time national champion. Special thanks to the Maryland Jousting Tournament Association for their help with compiling the history of jousting and providing several photos. Modern day jousting really has become an all-around family sport. With classes open to all skill levels and ages, the sport promotes a family atmosphere and has created a community of jousters that support each other in many ways. Now at the young age of 13, Mikayla travels all over the state to local tournaments as well as outside Maryland to compete at the national level. 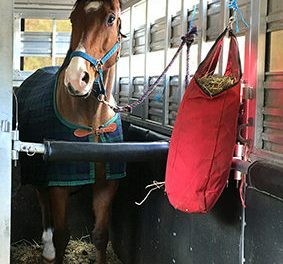 Her jousting equine partner is an Appendix Quarter Horse named Tyke, who is owned by Marcia Olson and boarded at Tynwydd Farm in Saint Leonard. This year, Mikayla attended 12 of the 25 jousts held in Maryland. Mikayla has now reached the semiprofessional level, which is a huge accomplishment for someone of her age. Because of this move-up in mid-season, she was unable to defend her Amateur National Championship title, which she won in 2011. She said being awarded the Touch of Class award was “an unexpected honor” and that her family is very proud.